We want to thank you in advance for taking the time to watch this short video presentation and provide us with your valued feedback. This presentation will only take about 5 minutes and will provide you with an overview of the SF Families website. Please go through the following steps and complete the online form that can be found in Step 3. Step 1: Please watch the following video. 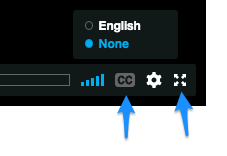 Tip 1: Select the (closed captions) icon in the bottom right to enable subtitles. Tip 2: Select the (full screen) icon in the bottom right for a better viewing experience.